The dusty, tarred and paved alleys / roads of Fort Cochin especially in and closer to the old town / harbour entrance can be explored at a leisurely pace for hours on end. On my first visit I ended up getting lost and walking with a heavy backpack for an extra few kilometres. Some great little snack bars and restaurants can be found in this area, which is mostly alcohol free (I did find one official bar doing limited sales). Late afternoon through the road network ending with an ice-cream is a must-do. Morning walks are also great and present some lovely photo opportunities with golden rays striking through the alleys and trees. Think… relaxing lazy days, market buzz in the distance, dogs napping nearby, the odd fly buzzing around and crows waiting for a titbit: I love India! Further along the dusty, tarred and paved alleys / roads of Fort Cochin is the promenade where people gather at the waterfront to exercise, socialise and or just watch the sun go down. I said earlier that Fort Cochin could be described as the cutest little town I have discovered this far in India; it’s maybe also the most “innocent”. 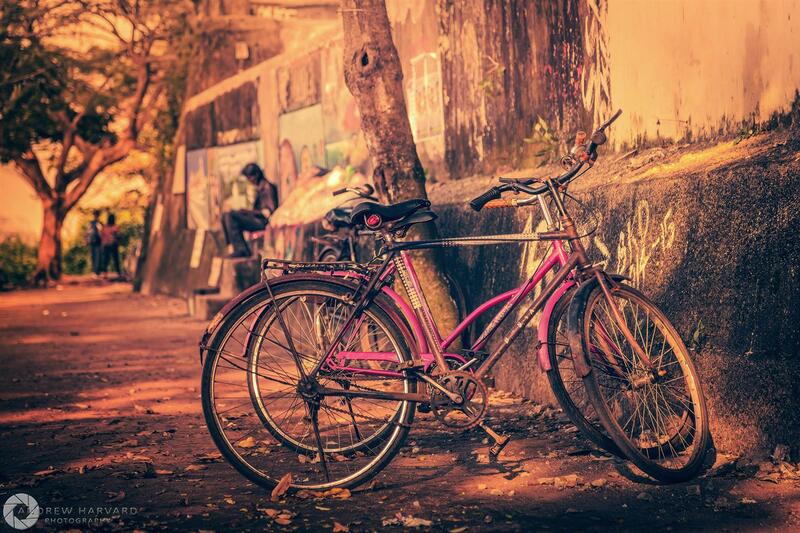 The photo below is of two bicycles parked off while their owners watch the sun slowly go down. A gent is seen reading in the background with two passers-by heading along the dusty sand pathway.